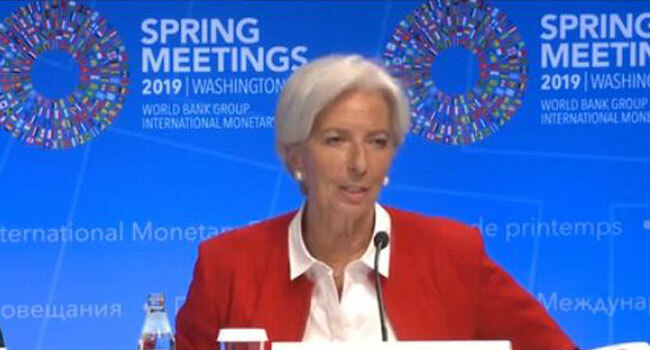 The Managing Director, IMF, Christine Lagarde at a press conference on Thursday, during the on-going joint annual spring meetings with the World Bank in Washington DC. The International Monetary Funds (IMF) has asked the Nigerian Government to consider the complete removal of fuel subsidy. Addressing a joint annual spring meeting of the World Bank in Washington DC, United State, she explained that the move would save a lot fiscally and in terms of human lives. “If you look at our numbers from 2015, it is no less than about $5.2 trillion that is spent on fuel subsidies and the consequences thereof,” she said. Lagarde added, “And the Fiscal Affairs Department has actually identified; you know how much would have been saved fiscally but also in terms of human life if there had been the right price on carbon emission as of 2015. The numbers are quite staggering.